There are many changes our children will face throughout their lives and part of our job as a parent is to be there for them and help to guide them through these changes. Of them, one of the biggest will be school transitions. Until your child graduates high school, around age 18, school is their job and a huge part of their lives. There are times when school will change such as during a move, or when your child moves up from elementary to middle, and then to high school. These transitions can be stressful and how you support your child throughout is very important. 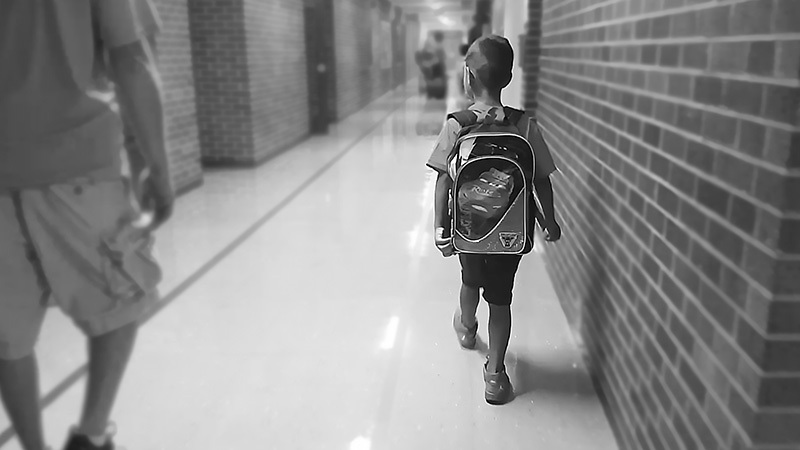 We were faced with a new transition- my children began new grade levels at a new elementary school. No, we didn't move. Long story. When I enrolled my eldest child, my daughter, in kindergarten six years ago I went to what I thought was the closest school to us. We later found out that she was supposed to attend a school that's actually closer, but I had no idea it existed. The district allowed in-district transfers so we were fine where she was until recently. Last school year, the district stopped allowing in-district transfers, except for a few criteria in which we did not meet. My children were upset and anxious because they were worried about leaving their friends behind and also concerned about entering unfamiliar territory- new school and new staff. Their former principal knew them by name and we loved the teachers there. -Visit the school before school starts, just you and the kids. We were able to visit the school and get familiar with the school grounds. -Talk about what can be expected during transitions such as moving up a grade or starting at a new school and highlight positive possible outcomes like making new friends, a new playground, new fun activities, etc. -Listen without judging to what your child has to say about the school and the transitions. -Explain that it is normal to feel anxiety about changes and let your child know he can always come to you and talk about those feelings. -Talk with your child daily about school, expectations, relationships, and how they feel overall about everything. -Find out what supplies your child will need in advance and buy those needed supplies, buy them, and be involved with your child’s school and assignments. -Try to avoid asking other parents their opinions about the school and be prepared to form your own. I received mixed reviews from two different parents whose have children with completely different needs. Now that you have these tips, it will help you to help your child through the various transitions of school life. There will always be ups and downs but you can be there to encourage and support your child throughout it all. Have you had to deal with any school transitions? How did you help your child(ren) adapt to the new changes? Earlier this year during spring 2nd semester of 4th grade, my daughter Phoenix had a tough time adjusting, she's shy and doesn't make friends as easily as my son, however, as the year progressed and with encouragement from my husband and me, she managed to settle in fine within a few months and excelled academically as she always has, calling herself a "teacher's pet". While is 2nd grade at the new school my son Zac was accepted into a special program for gifted students that he loves and is excited to continue once it starts back up again in a couple weeks. The staff turned out to be great and we're all very satisfied. Last week Zac and Phoenix began 3rd and 5th grades at the new school, while Gabriel, began Kindergarten. So far this school year, Gabriel, my sweet kindergartner, has rushed us out of the door every single day, excited to go to school. You know your projects stand out of the There is something special about them. It seems to me all of them are really brilliant! In your blog I was happy to see your article, delhi school admissionbetter than last time, and have made great progress, I am very pleased. I am looking forward to your article will become better and better.